Juan Martin Del Potro advanced to the second round of the Delray Beach Tennis Championships Tuesday night with a 6-4, 6-1 win over Richard Berankis of Lithuania. Del Potro and Berankis traded breaks early in the first set before going back on serve in the sixth game. Serving at 4-5, Berankis was broken, handing Del Potro the first set. 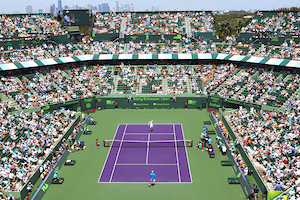 In the second set, Berankis was no match for Del Potro who easily ran away with the second set and the match. Q: Since your return from your wrist surgery have you had to adjust the way you play or are are playing at the same level when you won the US Open? Del Potro: It depends on the climate and how I feel on a given day. I do not have the same strength however my game remains the same. I try to be aggressive with all my shots as that is what has allowed me to win tournaments. Q: Are you taking any special measures to protect your wrist or are you back to 100%? Del Potro: No, I’m still rehabbing and receiving treatments. It is a very long process. It still hasn’t been a year since I had the surgery. The norm would be that I would have some pain. At the moment [the recovery] is going well. 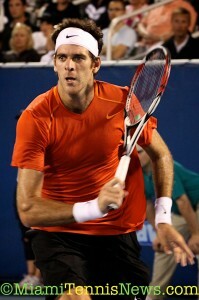 Del Potro, who is making his first appearance in Delray, will face Teymuraz Gabashvili of Russia in the second round. On Monday night Gabashvili upset the fourth-seeded American John Isner in a three sets. Earlier, second-seeded Mardy Fish advanced when Bjorn Phau retired in the first set. Fifth-seeded Kevin Anderson moved into the second round with a 6-7, 7-6, 6-2 win over Donald Young while Janko Tipsarevic beat Ivo Karlovic of Croatia. American qualifier Ryan Sweeting defeated Russian Igor Andreev 6-2, 6-3 in another first round match and Kei Nishikori of Japan defeated Brian Dabul of Argentina 6-2, 7-6. Dudi Sela moves on to the second round by defeating Marinko Matosevic. Matosevic was added to the ITC draw when Andy Roddick withdrew from the tournament on Monday due to flu-like symptoms. On Wednesday afternoon, Sam Querrey will take on fellow American Ryan Sweeting. The night session will feature a rematch of the 2008 ITC final when Nishikori faces wild card James Blake.